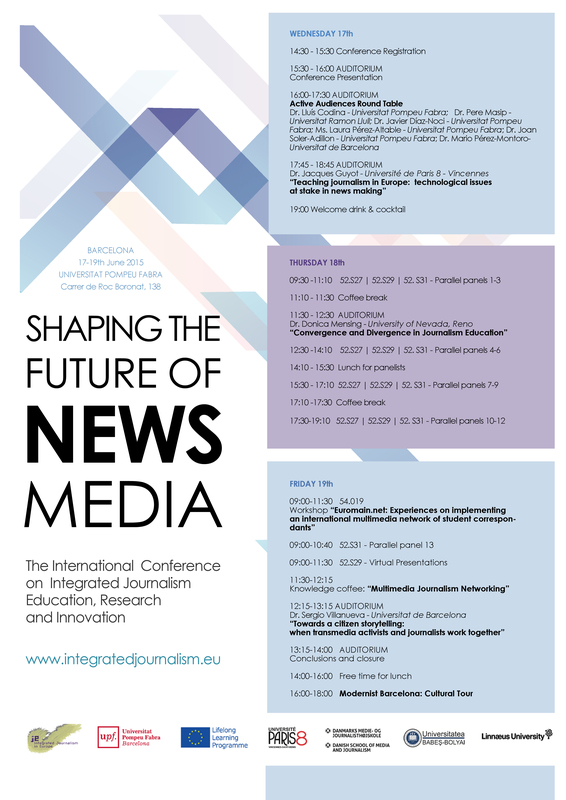 The “Shaping The Future of News Media” conference will host the roundtable “Active audiences” that will be presented by Lluís Codina and will have as speakers Pere Masip, Javier Diaz-Noci, Laura Pérez-Altable and Joan Soler-Adillon. Lluís Codina is a professor at the Communication Departament of Universitat Pompeu Fabra (UPF) and director of the Support Unit Educational Quality and Innovacció (USQUID) of the Communication Faculty. He also coordinates the research group Digital Documentation and Interactive Communication and is part of the Research Group in Journalism, both at the UPF and the latter recognized by the Catalan Government. He is also the author of over 200 publications and six books, the latest of which is titled The Semantic Web and Information Systems Documentary. According to his expertise subject, he is the founder and co-director of the first master taught entirely in Digital Documentation, related to Anuari Hipertext.net. Javier Díaz-Noci is a professor at Universitat Pompeu Fabra. Doctor in History, Master in Law and graduated in Journalism, he has been part of several research groups, as well as of a working group between Brazil and Spain. He has also participated in the European network researchers COST A20. Furthermore, he has been a visiting professor at Oxford University (1998-1999), University of Nevada (USA, 1997), Università da Bologna (Italy, 2007) and Universidade Federal da Bahia (Brazil, 2005 and 2008). Laura Pérez-Altable is a PhD researcher from Universitat Pompeu Fabra. Her thesis was titled “Networks digital media, online journalism and citizen participation during the Arab Spring: Tunisia, 17 December 2010 – 23 October 2011”, tutored by the professor Javier Díaz-Noci. Graduated in Audiovisual Communication, she did a Master of Advanced Studies in Social Communication at UPF. Her main research areas are cyberjournalism, new media, social networks and the history of mass media. Joan Soler-Adillon is a professor of Audiovisual Communication at Universitat Pompeu Fabra and a member of the Research Group DigiDoc, in which participates in the project “Active audience and journalism. Interactivity in web search of journalistic information”. Graduated in Philosophy, he also did a master in New York called “Interactive Telecommunications Program”, which was pioneer in digital media art. His academic research focuses on the idea of ​​emergence and its scientific and philosophical roots. The moderator will be Mario Pérez-Montoro, PhD in Philosophy and Educational Sciences at Universitat de Barcelona and Master in Organization Documentation Systems to the Company by Universitat Politècnica de Catalunya. His scientific career centres its attention to some of the different aspects of the theory of information and knowledge management. He is currently an associate professor at Library and Documentation Faculty at Universitat de Barcelona. 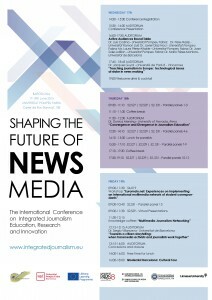 The first plenary session on Wednesday afeternoon, will be “Teaching journalism in Europe: Technological issues at stake in making news”, by Jacques Guyot (Université Paris 8 – Vincennes). Guyot is a PhD in Information Sciences from Université Rennes II and currently teaches at Université Paris 8 Vincennes, where he directs the Center for the Study of Media, Technology and Internationalization. His field of study is based on the internationalization of media, cultural and linguistic minorities and European audio-visual policy. The second plenary session will have the title “Convergence and Divergence in Journalism Education” and will be led by Donica Mensing (University of Nevada, Reno). Mensing teaches a variety of courses, from the introductory class in journalism to a graduate seminar in interactive publishing. Recently her study interests have been dedicated to networked journalism and what it means for journalism education, journalists and communities. A sample of her research papers include: “Popularity Is Not The Same Thing as Influence: A Study if the Bay Area News System”, “Rethinking Journalism Education”, “Participatory Journalism and the Transformation of News”, and “Doing Journalism Together: Experiments in collaborative news gathering”. The third and final plenary session will broached the following topic: “Towards a citizen storytelling: when transmedia activists and journalists work together”, and will be presented by Sergio Villanueva (Universitat de Barcelona). Villanueva is a researcher and teacher at Universitat de Barcelona. He currently works at Library and Documentation Faculty in relation to Audiovisual Communication studies. His fields of research include the involvement of the media, the public and the media community and gender representation in media narratives. His doctoral thesis was following this line: “Film and Social Change: analysis and characterization of participatory video as a documentary subject,” and was co-directed by Mario Pérez-Montoro and Lydia Sanchez.